When Jonathan Quiñonez set out to travel the world, he encountered one very serious snag: with time differences and pricey international phone calls, he didn’t have a reliable way of informing his mother of his safety and whereabouts (and we all know what happens when you don’t tell your mum you’re ok). The 27-year-old from Brussels developed an ingenious method of staying in touch: he started an Instagram account called @momimfine. 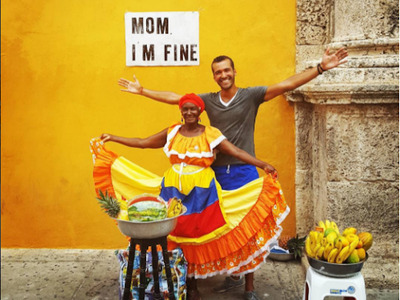 At each new destination, Quiñonez poses for a photo with a sign that reads “Mum I’m fine” and uploads the shot for his mum (and the whole world) to see. Here are some of Quiñonez’s best shots.